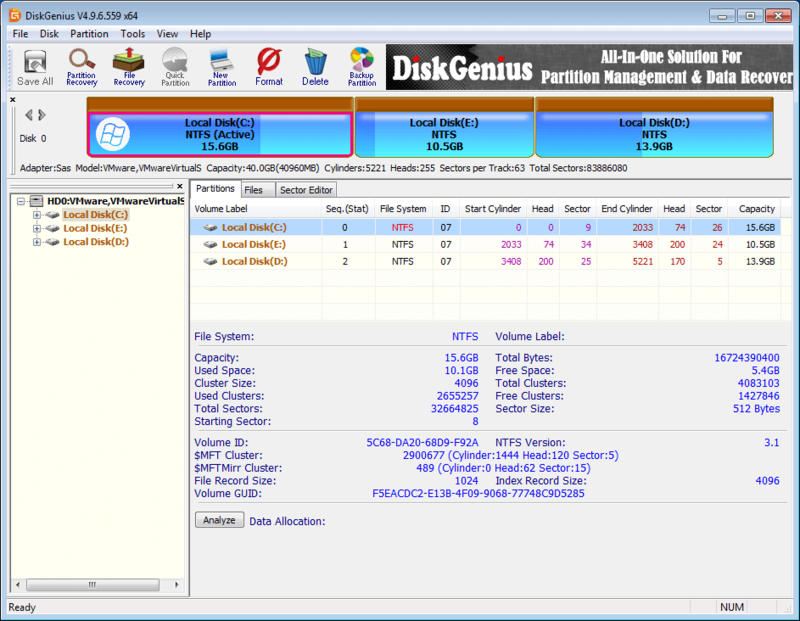 DiskGenius Free 5.1.1.696 Free Download - All-in-one solution for data recovery, partition manager and data backup. Last Updated: 4/3/2019 | File Size: 56422 KB | License: Freeware | Downloads: 794 | Developer: Eassos File & Partition Recovery ltd. Disk and partition conversion - Convert dynamic disk to basic, convert virtual disk format and convert MBR to GPT, convert primary partition to logical, etc. File recovery - It can recover files deleted or emptied form recycle bin, recover files from damaged partition or disk and recover files by file type and supports file preview and file filter. Partition recovery - It is the best partition recovery program in that it can recover files from damaged, corrupted and RAW partitions, search for lost partition and recover files from it, besides, it can fix partition table. RAID recovery - It can reconstruct Virtual RAID and recover files from it, and all RAID types are supported. Sector Editor - A Hex editor is embedded to help users edit raw hex data and recover data manually. Backup and Restore - It can backup and restore partition including system partition, hard disk and partition table. Bad Tracks - It can check and repair bad sectors for all storage devices; check hard disk S.M.A.R.T. information. Delete files permanently - It can delete files permanently so that they can't be recovered by any data recovery software. Virtual Disk - It supports virtual disks, including VMware, Virtual PC and Virtual Box. Support FAT12/FAT16/FAt32/exFAT/NTFS/EXT2/EXT3/EXT4 file system format. Statement: First, please download the orginal installation package by clicking the download link. Of course you may also download it from the publisher's website. Using DiskGenius Free crack, key, patch, serial number, registration code, keygen is illegal. The download file hosted at publisher website. We do not provide any download link points to Rapidshare, Hotfile, Depositfiles, Mediafire, Filefactory, etc. or obtained from file sharing programs such as Limewire, Kazaa, Imesh, Ares, BearShare, BitTorrent, WinMX etc. Software piracy is theft. If you like DiskGenius Free please buy it.